Coming up we’ll hear from Craig Hemke of the TF Metals Report. Craig gives perhaps the best explanation you’ll ever hear on the gold and silver price manipulation scheme and also talks about how the new Shanghai Gold & Silver Exchange may make it more difficult for these shenanigans in Western markets to continue. 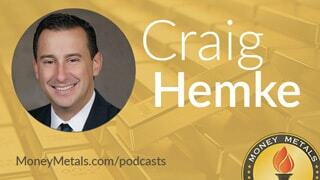 Don’t miss this truly explosive conversation with Craig Hemke coming up in just a few minutes. Just as markets can be unpredictable and defy all the analysts, so too can political campaigns. A few months ago, all the pundits, pollsters, consultants and establishment insiders were nearly unanimous in their insistence that Donald Trump had no chance of winning the Republican nomination. Well, on Tuesday they were all proven wrong. Donald Trump is now the presumptive GOP nominee for president of the United States. Suffice it to say, Trump is unpredictable. No one knows exactly how a President Trump would govern – perhaps not even the Donald himself. Do you think that she should be raising rates now, not raising rates? What is she doing wrong? I have nothing against Janet Yellen, whatsoever. I think she's been doing her job. She's always been a low interest rate person. I must be honest, I'm a low interest rate person. If we raise interest rates and if the dollar starts getting too strong, we're going to have some very major problems. We have another problem with raising rates. We have $19 trillion of debt. It's going up to $21 trillion. We have numbers that are beyond belief. We're paying a very low interest rate. What happens if that interest rate goes 2, 3, 4 points up? We don't have a country. If you look at the numbers, they're staggering. Of course, Trump is right that our national debt has risen to “staggering” proportions. And to his credit, he did oppose last year’s bipartisan budget deal that saddled the country with trillions more in debt. But what Trump clearly does NOT understand is that no one in Washington will feel any real pressure to balance the budget as long as interest rates remain artificially low and Janet Yellen stands ready to buy government bonds in unlimited amounts. Yes, raising interest rates and letting the dollar strengthen would be painful – at least for the federal government and other major debtors. But a stronger dollar policy would be a boon to savers. More importantly, it would take away the sense among members of Congress that they are spending free money. Congress would finally be forced to make some tough decisions in the direction of fiscal responsibility. Unfortunately for sound money advocates, it appears that Donald Trump is intent on pursuing a weak dollar policy. Needless to say, Hillary Clinton would have to do likewise, given all the unfunded spending programs she is promising to the left wing of her party. What this all means for investors is that they should be positioning themselves for negative real interest rates and the likelihood that the dollar will continue to lose purchasing power regardless of whether Hillary or Trump wins in November. What negative real interest rates mean is that you can’t earn a positive, after-inflation return on cash or Treasury bonds. Lately, official inflation rates have been running extraordinarily low, meaning it has been possible to eke out a small positive real return on low-yielding instruments. The problem is that when inflation starts ticking up even modestly, low yields can quickly turn negative in real terms. And when that happens, gold and silver become a lot more attractive as safe-haven assets. There’s a very good chance that owning precious metals will pay off during the next administration, regardless of whether it’s Republican or Democrat. Because the political reality is, there is virtually no chance of the nation’s mounting fiscal problems being solved in the foreseeable future. The precious metals markets are certainly performing well so far in this election year. But they did pull back a bit this week. Checking in with the gold market, prices are coming in at $1,289 an ounce, down just 0.4% now on the week thanks to a rally here today after a weaker than expected April jobs report came out this morning – meaning a rate hike in June by the Fed is looking like it’s now off the table. Silver is headed for a bigger weekly decline of 2.2%, with prices currently trading at $17.51 per ounce – and barring a big advance here before the end of trading today we’ll see the string of four straight weekly gains for silver coming to an end. As for the industrial precious metals platinum is now flat for the week thanks to today’s advance and is coming in at $1,081 an ounce, while palladium trades at $609, posting a 2.4% weekly loss as of this Friday morning recording. It’s not too surprising to see precious metals give back some of their stellar gains from April in this first week of trading for May. Commercial traders had been positioned heavily short in the futures market, and they typically get their way when they push their positioning to extremes. So far there are no signs of a major setback in these markets. Gold and silver still have an opportunity to find some technical support levels and resume their uptrends. Well now for more on where the metals are headed and some key insights on why gold and silver have been performing so well this year, let’s get right to this week’s exclusive interview. Mike Gleason: This is Mike Gleason with Money Metals Exchange and it is my privilege now to welcome in Craig Hemke of the TF Metals Report. Craig runs one of the most highly respected and well known blogs in the industry and has been covering the precious metals for close to a decade now and puts out some of the very best analysis on banking schemes, the flaws of Keynesian economics, and evidence of manipulation in the gold and silver markets. Craig, it's great to have you back with us and thanks for joining us again today. Welcome! Craig Hemke: Mike, it's my pleasure and thank you for the kind words. I appreciate it. Mike Gleason: Well, Craig, for starters things certainly are quite different here in early May as opposed to when we had you on the show back on January 7th. Gold is up 21% on the year so far and silver has had an even bigger advance, thanks mainly to a strong month of April, and is now up 26% year to date. Now, we have had a couple of periods over the last several years where we started out with some positive price action but didn't get any follow through, specifically in early 2014 and early 2015. But to us this time it just feels different. How about you? Do you think that we finally started a new bull market phase here and what is the pulse of the average metals investors because so many of them frequent your website? Craig Hemke: Boy, I hear you, Mike, and it definitely does feel different and actually it looks different. I think the reason you get that feeling is that ever since metals were taken down and broken through support of $1,525 in a just disruptively manipulative move back on April 12th and April 15th of 2013. They’ve been a pretty significant, never, almost, endless down trend of lower highs. You get a little rally but it would never get back up and breach the previous high. Then it would roll back over and we'd watch open interest expand, and the bank short positions expand, and then it would roll over again. It just seemed like it was just endless and we'd never find a bottom. When we in fact finally did find a bottom it almost seemed that the physical market finally precluded the paper market going much further, particularly in silver. Now, here in 2016, there are a number of unusual things taking place that make you think, yeah, you know what; we're finally in what I would characterize just a resumption of the Bull market that began in 2002 or 2003. And we have finally made higher highs, not only in gold but finally now in silver too. Gold initially, when it got rolling in February it finally made a higher high. It got above the $1,190 level, which had been the previous high from October of last year. It then continued on and got through the $1,230 level, which had been the high back in May of last year. And just earlier this week it got all the way up to $1,306, which is almost exactly to the levels seen in January of last year and it keeps chugging higher. Silver has done the same thing. It initially had some trouble getting through $16.38 but it got through there. It then got through $17.71, which was its level from last May; did that last week. Now it's set its sights on its highs of last January as well. Like you said, it definitely feels different because it looks different. And this is a complete change of the trend that's been in place, like I said, for over 3 years, and it certainly looks it wants to continue. Mike Gleason: You've been covering the newly formed Shanghai Gold & Silver Exchange there at TF Metals. And this development has been getting a lot of attention in the gold and silver community at large. With Shanghai being an exchange where contracts are backed by way more physical metal compared to the COMEX, it seems to us that more and more trading will migrate to Shanghai. That said, investors should not blindly trust any exchange dealing in paper metal and it should be noted that this one is under Chinese government control. Do you see the Shanghai Exchange improving price discovery? Also, will trading there make it harder for manipulators in the West to succeed? Craig Hemke: Absolutely, Mike, no doubt about it. This is one of the biggest developments that we've seen in the physical market in maybe a hundred years in that for the past 97 years total pricing, let's call it pricing ability, on the wholesale market has been controlled in London through the twice daily fixes. For folks that don't quite understand how this works, we all see the spot price trading and flipping around during the day and we see the futures market, which are still a relatively new invention. The COMEX just came into play 40 years ago, and so on the very large wholesale level, jewelers and mines, producers, consumers, where do you price your big deals on a daily basis when we're talking thousands of ounces or even tonnage levels for gold and silver too? You can't just pick a date in time and say, well, the spot price was X at 10:02 London time. There has to be some kind of international reference point and that's what those London fixes are. And those have been the only international reference points now for 97 years. That was until April 19th, about 2 weeks ago, when suddenly, after much work and a lot of foundation laying, we suddenly now have a Shanghai twice daily gold fix, it’s not priced in pounds like what you have in London. It's actually priced in the local currency, the yuan. It's a very big development. It is a natural occurrence in that all of the gold is migrating to the East so therefore the pricing power should be migrating to the East as well. I think the Chinese are set to dominate the global gold market in the 21st century the way that London was set to dominate it in the 20th century. You make an important point, Mike, in that London is primarily a paper market and the volumes that are cleared there on a daily basis are just mind blowing and certainly not physical volume. It's just all paper volume. Shanghai, instead though, is a physical market and where this gets very interesting at some point in the future is that the Shanghai Exchange, which is really just an extension of the Chinese government if you will, has the ability to control a significant level of arbitrage between the East and the West and arbitrage between paper in the West and physical in the East. And they can kick off that arbitrage any time they want in how they set their benchmark, where they set this yuan denominated fix. If it's a $2 spread, and I'm mixing all these currencies together, but let us just say if it's a $2 spread between London and Shanghai, probably not enough for anyone to go through the trouble of taking 400 ounce physical bars out of London and getting them converted into four 9s purity kilo bars and delivering them to Shanghai. But if the Chinese government wants to set that at $20 an ounce or $30 an ounce, they will most certainly affect that arbitrage and rapidly increase the drain of physical gold from London and exponentially increase the level of pain that the bullion banks feel trying to meet all of their obligations. So this is a game changer. It shouldn't be any surprise that price was being worked lower through April and then suddenly has moved higher since April 19th. A lot of that has to do with currency movements to, but nonetheless that's no coincidence. This is just a big hammer hanging over the global gold market that now the Chinese control. So this is a big deal. I'm glad you brought it up and it's something that all gold investors and traders everywhere need to be up to speed on. Mike Gleason: I wonder here, will we wake up one day and find that the Chinese are done going along with the West's gold suppression schemes and they decide to flip the switch. As you mentioned, they have that hammer now and they can just say, "Okay, it's now in our best interest to let gold revalue much higher. We've built all the reserves that we want. You foolishly sold your gold at bargain prices and shipped it East, but now were done." Could something like that happen? Craig Hemke: If you think about this, Mike, and I've been writing about this, this week, as price has risen this year and even just since the end of January, total open interest on the COMEX has risen by nearly 200,000 contracts or 40%. Price is only up, what, 15%, or 20%, or whatever it is since the end of January but open interest has 3 times that rate. That's primarily these big banks like JP Morgan, HSBC, Scotiabank, Barclays, UBS, Deutsche Bank, all the bad guys, them taking the short side of the trade versus the speculators taking the long side and this paper just keeps getting supplied to try to tamp down price as it goes. If the amount of paper were to stay static, you’d actually have to find a price equilibrium where there are willing sellers of existing paper but instead the supply of paper continues to grow, which tampens and dampens down how much price rises on a daily basis. But nonetheless we'll get a Commitment of Traders report on Friday that will very likely show that the gold recalled on the “commercials”, which is really just a primarily a collection of these bank trading positions, the gold commercials at least on the COMEX, now they may have off setting positions in London and in the real opaque, over-the-counter markets, all this kind of stuff, but on the COMEX these gold commercials will have a gross short position, not net, not offset by some launch, just a gross short position of excess of 400,000 contracts. Now, they may have, like I said, 150,000 launch; the net position maybe is 250,000 contracts but just from a gross standpoint, 400,000 contracts is 40 million ounces of gold, okay, that by being short, in a sense you're on a hook to deliver. Now, nobody ever delivers it. The COMEX isn't a physical market at all. It's just a BS paper shell game and the only delivery process is a handful of warrants that get exchanged back and forth between the banks every other month to give up the charade, the illusion of delivery. But, but if the Chinese, recognizing this extreme leverage in the paper markets of the West, if they wanted to utterly crush the banks and in the process of rolling out their alternative currency system leave the world no alternative but to use it because all of the Western banks have been destroyed, they've got the ability to do it now. And all of that leverage, all of these schemes, all of these games that have been played with the gold price, through the financial, the futures market for the last 40 years will finally bring about the end of everything. Again, it's impossible to say if that's going to happen next week. It could. They now have the ability to do it next week if they want but this time is coming. There's no doubt in my mind. The Chinese think in terms of decades and centuries, right, the Ming Dynasty kind of stuff that they know that he who owns the gold makes the rules. They've been accumulating the gold. They will be the power with the gold. This structure of the global reserve currency system is a transient thing. The U.S. has had that power for 7 years, before them it was the British, before them it was the Portuguese and all that kind of stuff. The Chinese see themselves in that role in the 21st century and it's just a matter of time before it can heads that way. When all the dust settles let's just put it this way, my gold's not going to be $1,280 an ounce. Mike Gleason: Yeah, I highly doubt it. It leads me right into my next question here. In an article you wrote this week, you gave a great explanation of the difference between buying a stock and a trader investing in the metals futures contract. If someone buys a share of stock in Coca-Cola, for instance, the supply of shares is limited and someone has to sell existing shares. That is true price discovery but as you explained, when you buy a futures contract, a bullion bank can simply print a new contract and it's totally unbacked. So essentially, trading a futures contract is like betting on the price of apples and the guy on the other side of your bet owns all the orchards. So you're making a crucial point here that most people overlook. Explain that to our listeners why you think the futures market and just expand on that, how it's anything but free and fair. Craig Hemke: Yeah, again, most of the volume on a daily basis in gold and silver in New York on the COMEX is an exchange of existing contracts. There's no doubt about that. You can look at the volume every day and compare to the daily changes of open interest. But as we noted earlier in this discussion, you go back to the end of January and total open interest on the COMEX in gold was 373,000 contracts. As of last night, it's like 568,000 contracts so there's 20 million ounces of gold, paper gold that have been created out of the clear blue sky over the last 100 days. And so it has an effect of tamping down the daily gains because you can see it. Like last week, here gold had this almost historic week and again think about that in perspective of what has happened this week, but on the calendar week last week, Monday through Friday, that last week of April, gold was up $60 in 5 days! That's just a huge move, right? That's almost 5% but over that same time period the open interest expanded by 10% as banks just simply create. They just have this ability, whether it's JP Morgan, or HSBC, or whatever, to issue new contracts, take in the short side and selling them to the speculators, the HFTs, the algos, the hedge funds, whatever, that are seeking exposure to gold and buying a futures contract. And so the question becomes again, on a day like, say last Friday, I think it was last Friday where open interest was up 20,000 contracts while price was up $20. If that additional 20,000 contracts wasn't fed into the market and 20,000 buyers had to actually find 20,000 sellers, how much more would the price have risen that day? That's where this whole fallacy of market, and traditional technical analysis, and all this stuff just falls flat because guys will sit there and look at it and say, "Well, you know, gold sales that get through this Fibonacci level, or Wave C, Sub-Wave B, Level A," all that jazz... well okay, but how would that have been affected if the banks hadn't been able to supply 20,000 additional contracts on that day? You know what I mean? It's a totally, totally unfair and fraudulent way. Mike Gleason: And even given all of that, there are some out there who say there’s no manipulation going on whatsoever. What’s your response to that? Craig Hemke: There's this notion out there and that is put forth by the manipulation, I call them the manipulation deniers, the shills and apologists for the system who for whatever reason, whether it's trying to defend their own business model as a newsletter writer or whatever. And they're out there and they try to claim that the price of gold and silver isn't manipulated, and it's a free market, and all that kind of stuff. They look at all of us, and talk about manipulation, as if we just came up with this as some theory to explain why prices have gone down for the last 36 months, that we have no other reason as to how, "How in the world did this happen? Must be manipulated," when the manipulation of gold and silver is not conspiracy theory, it is historical fact. You go back to the 1950s, the U.S. lost a third of their national gold hoard in 1956 and 1957 trying to defend the pegged price of $35 an ounce. There were hearings. You can look this up. You can Google this stuff. There were hearings on Capitol Hill, "How can this happen? We've lost a third of our gold because the dollars convertible in the gold," and all this kind of stuff. Well that wasn't going to work as the US tried to defend $35 an ounce. That's manipulation. You're feeding physical in the market to keep the price where it is. So what happened? The U.S. decided, "We can't do this ourselves," so we put together what's known as the London Gold Pool, again, a term anybody can Google. From 1961 to 1968 the U.S. and seven other countries deposited gold in London, physical gold that was used to keep price at $35 an ounce. Anytime there was demand, the Gold Pool would dump physical onto the market, and wait for the price to come back down, and then buy it back. That was how it worked. Well, finally that was broken. In 1968 the London Gold Pool fell apart. Eventually Nixon had to close the gold window. Gold starts to shoot higher and then somebody really got smart and said, "Wait a second. Why are we supplying physical gold trying to suppress prices? It doesn't make any sense at all. Why don't we create and do some alchemy and we introduce paper gold? Nobody will ever take delivery. It will be beautiful. We'll never have to supply any. We'll lever up what we have." And so the timing of this was even equally brilliant because on January 1, 1975, after a basically 40 year prohibition, U.S. citizens were finally allowed to own gold again, January 1, 1975. Mike, do you know what date COMEX gold futures started trading? Mike Gleason: My guess is probably right around that same time. Craig Hemke: December 31st, 1974. Imagine that and ever since you could call it the “New York Gold Pool” because gold price has been managed by this same process but now instead of delivering actual, physical metal trying to control things, they've used futures contracts instead. Manipulation of gold and silver prices is a historical fact. It's not conspiracy theory. These goons that are out there trying to make it sound like this is just some scheme we've all concocted as an excuse as to explain why gold has gone down for three years, that's just horse hockey. That's a total disregard of the historical record. Anyway, I've had enough coffee this morning, Mike. You've got me thinking about that and I just thought I would kind of relay that story again for folks. Mike Gleason: Yeah, all great points. Switching gears a little bit, mining stocks are definitely confirming the move in the bullion and we've also got silver leading the way, which we like to see as well. It's good to have the white metals start to lead the yellow like that have in recent weeks. Give our listeners your take on the mining shares and what the action in that market is telling us. Craig Hemke:Well, when we mentioned early about how things kind of felt different, right, and how, wow, this is really something, we've got the higher highs on the chart? Boy, the action in shares definitely confirms that too, doesn't it? It was really fun to watch things turn back in January because at TF Metals Report we were watching all through last year. In fact, I'll take it back even further. I feel one of the columns I've written over the years that I feel just so fortunate, at least for my own personal well-being, that I wrote, was in January of 2013. The HUI Index that day was like about 450 and I went through all these different individual minor charts and concluded and said, "Why on earth does anybody even fool around with these things when you could just buy physical metal?" And things, almost immediately, later in April, things really went in the tank. What the HUI went from, whatever it was that day, 440, 450 all the way down to 100. And so I have at least always felt like, okay, at least I'm on the record for saying that but when it came down late last year to that 100 level, it was actually about 105 on that index and it just flat lined. I mean it held 105 as support for almost 6 months and it got everybody on my site, it got our attention. We thought, "Okay, well let's just see if it starts to roll from here," and it has. And now we're up, what 125% maybe and really without any corrections. It'd go up, and we traded kind of sideways through March, and then finally burst to a new high, and traded sideways for 2 or 3 weeks in April, and burst to a new high. Yeah, we've given back 10% this week but jeez, after a 125% run, that's not too shabby. The only thing I would add to that is that there's definitely a lot more room to go as long as gold and silver keep going. The amount of institutional ownership of the shares is minimal. If that starts to pick up, if people start to recognize the value that is still there, even though shares have more than doubled and sometimes tripled, relative to where they were in 2010 or 2011, extreme value. And I'll give you one more thing. I had a chance to talk to Keith Neumeyer, the CEO of First Majestic Silver, a couple of weeks ago. I just asked him, it dawned on me when I was interviewing him, I said, "You've produced 20 million ounces a year," and I don't mean this like it's a plug for their stock or anything. I'm just using this as an example across the board for the entire industry. I said, "You pull out 20 million ounces a year. How much, at least for your company, how much flows through the bottom line for every dollar that silver goes up?" And he said, "It's about 90%," and so for every dollar silver goes up, they make an extra 18 million bucks, and again that percentage is going to vary from company to company but dang, if you look at silver and think, well we could go to $22 or $26. I mean these shares are going to keep going up. And lastly, if you go to a site like a Barchart.com or something like that where you can overlay one thing versus the other, pull up about a 5 year chart gold and overlay it with a 5 year chart of the HUI, the miner index, and you can see the two they just, they move relatively in tandem. So at the end of the day, if you've seen the miners go up and you haven't been participating, wondering if it's too late and all that kind of stuff, really, all you've got to ask yourself is if you think gold's going higher. If you think the banks are getting ready to smash it back down, then you should be ringing the register and not buying any shares but again gold's going to keep going up for the reason we've been talking about. Then the miners are going to keep going up regardless of how far they've already come and whether some technical indicator looks like they're over bought. At the end of the day, just make your own projection whether you think gold and silver are going higher from here and then you can decide from there whether you should own some shares. Mike Gleason: One thing that is going to be very interesting to see is what happens when the public finally wakes up and discovers that we're in the midst of financial and monetary turmoil, and then comes to the realization that all the national debts and obligations are essentially unpayable without the continued devaluation or maybe even an implosion of the U.S. dollar. Now, all indications are that maybe 1 or 2% of people in America own any bullion at all. If that goes to just 5% or gosh, if it went to 10%, the markets may well not be able to deliver it, Craig. We've seen periods of time in recent years where demand, largely from investors among that 1% that already own some precious metals, really overwhelmed the mints and refineries. So as we begin to close here, Craig, do you believe that a day is coming where all of a sudden the demand, perhaps as a result of a public mania, is going to totally outstrip supply? And what would that look like and what impact would that have on prices? Craig Hemke: I would encourage everybody to go back and watch. In January a friend of mine, a guy that I've gotten to know a little bit by the name of Grant Williams, writes a newsletter called Things that Make You Go Hmmm. It's often published at ZeroHedge, anybody can look up Grant Williams on the internet. And he put out a video in January, right as this was getting started. I think the title of it was, “No One Cares.” It was all about some of the stuff you just mentioned, Mike. And buried in that were some stats and I'd have to go back and re-watch it, the stats, that I've got them all straight. I'm not going to try to quote them and butcher them but it was just of the utterly small size, not only of the futures market and how little capital it would take to just utterly wipe out, particularly silver, the futures market but all of the mining shares as well. A couple billion dollars would basically buy you, at least at that time, not any more, but at least at that time, like the top 20 miners. You could just buy them all. It was head scratch; it was like, "Are you kidding?" It was that small of amount of money so to your point, yeah, if hedge funds, pension funds, all these places that are looking at negative interest rates and just desperately searching for yield and return and they start seeing a sector like the mining sector going up, and they buy gold because, well, yeah, it doesn't pay a dividend but that's better than a negative dividend. Yeah, the whole thing could really get out of hand real quickly. Then you throw in all that other, that China stuff we talked about too. So yeah, there is a lot of reason to be excited that things could still get quite disorderly. I would just go back to one last thing about the paper markets. We've talked about how these massive levels of open interest, and how these contracts aren't backed with physical metal at all. And the amount of leverage involved, not only in New York but in London, and how many times an ounce of gold has been leased and released, and use that term hypothecated and re-hypothecated. And who owns clear title, and how many unallocated accounts are there out there where you're in a pool of gold and, "Oh yeah, sure, anytime you want it, we'll get it to you. Don't worry about it," all banking on the idea kind of like George Bailey's Building & Loan or any other fractional systems, that, "When you need the gold we can get it to you." But if everybody wants it at once, the first time there's a delivery failure and all of a sudden the music stops, and there's 100 people walking around the dance floor with 1 chair to sit on, it's going to be mayhem. Again, to some extent the Chinese have the power to break the record player any time they want. And so at the end of the day we can talk about it, we get all excited about $10 down drafts, and, "Oh they're the banks and they're coming to get us," and all that kind of stuff. I don't even care anymore. I just keep buying. I bought another ounce of gold this week. I just picked it up, the UPS guy brought it yesterday. I don't care what the price is. People say, "Yeah, you're paying too much premium." Whatever, look, whether I pay an extra $40 an ounce at this point, it doesn't matter because at the end of the day, like I said, it's not going to be worth $1,280 bucks. So folks just need to realize that this whole scheme is on its last legs and you just need to patiently hang in there, continually add to your stack on a dollar cost averaging basis. Your company's a great one to use for that and people just should hang in there and just recognize that this end game is coming, and, like we say at TF Metals Report, prepare accordingly. Mike Gleason: Well, wonderful insights, Craig. I really enjoyed talking with you as I have before. And I look forward to doing it again. We always appreciate your time. Now, before we let you go, tell our listeners about the TF Metals Report and what they'll find if they visit your site. Craig Hemke: The best thing about my site is what has always been the best thing about my site, is it's the community. It's not like a Yahoo message board. Everybody's there, we all know we're in the same boat. We're all there to help each other prepare accordingly. Yeah, I add some value in the stuff that I write, and the podcast I record, and the webinars that we hold, but the real value of the site is just everybody else that uses it and the links that they find, and the information that they post, and the discussions that are prompted. It's a place I'm really proud of, what we've built there. A lot of it is free but from the subscription side, if you really want to interact, the things a whopping $12 bucks a month so we're talking, whatever that is, $.40 a day; hopefully it doesn't price too many people out. I just encourage everybody to check it out, especially, again, if what we've talked about is ringing some alarm bells with you and making you think, come check us out, again, TFMetalsReport.com. Mike Gleason: Well, I can say it's high on the list of basically everyone in this office. We're visiting it frequently. It's fantastic stuff. Thank you again, Craig, and hope you have a great weekend. Look forward to catching up with you down the road. Craig Hemke: Thanks, Mike, the best to you and everybody there. Mike Gleason: Well that will do it for this week. Thanks again to Craig Hemke. The site is TFMetalsReport.com; definitely a fantastic source for all things precious metals and a whole lot more. We urge people to check that out.